Everlasting Joy: Is God Still Faithful When the Storm Doesn't End? 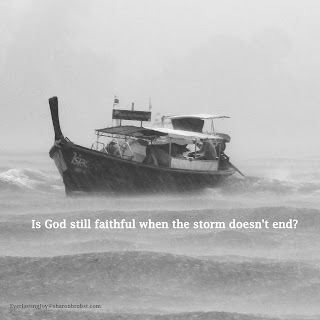 Is God Still Faithful When the Storm Doesn't End? Recently I have heard several proclaim God's faithful as a result of answered prayer. They praised God because He provided a job, healing for illnesses, and the return of a prodigal child. Those around them rejoiced and exclaimed the goodness and faithfulness of God, as we should. God is good. He is faithful and together we can rejoice when we see clear evidence of His goodness and grace to us. But as I sat there a question came to my mind. I am not exactly sure where it came from and I do not believe the question was meant to be asked aloud at that particular time. But it was question that my own heart needed to answer. The question my heart asked was, "Is God faithful and good even when things do not turn out the way I expect?" My immediate response was "Of course He is! God is always good. He is always faithful. Even in those times I don't see His answers or understand what He is doing." The question haunted me. I was not satisfied with my quick heart response. Would God still be faithful if a sick child died after much prayers? Would God still be faithful if your husband chose to walk out of your marriage after praying and fighting for healing? Would God still be faithful if your child remained a prodigal even though many were praying for her? Would I still see God as faithful if I had to walk the rest of my life in pain, never to be healed? Could I walk through whatever I am walking through, without any apparent answers, and still proclaim God good? The truth is there are days I struggle believing He is good to me. I struggle to believe in His faithfulness. It's easy to proclaim God's goodness when things turn out the way we think they should. It's easy to give thanks when God answers our prayers with a yes, or answers beyond what we asked or imagined. But when His answer is no it can be harder to see and trust in His goodness. I am learning that I need to know and understand that God's faithfulness is a part of His character. His goodness is not based on what He does and doesn't do according to my plan, it's who He is. God is faithful according to His plans, not mine. I may not see the end of a particular season of suffering but I can trust in God's goodness to see me through. The thing is, regardless of how I might feel God remains the same. God is good. God is faithful. There is nothing that can change those facts. If I feel that He isn't good or faithful in my life, whatever the circumstance, then I have a wrong view of God and I am believing lies. Nothing can or will change who God is. We speak of God's faithfulness while we walk through the storms of life but can we speak of His faithfulness if the storm doesn't end? I want to be more mindful to sing His praises in the storm, not just when the storm is over.